On April 8, 2014, Microsoft will kill a loyal, dedicated friend of 10 years. 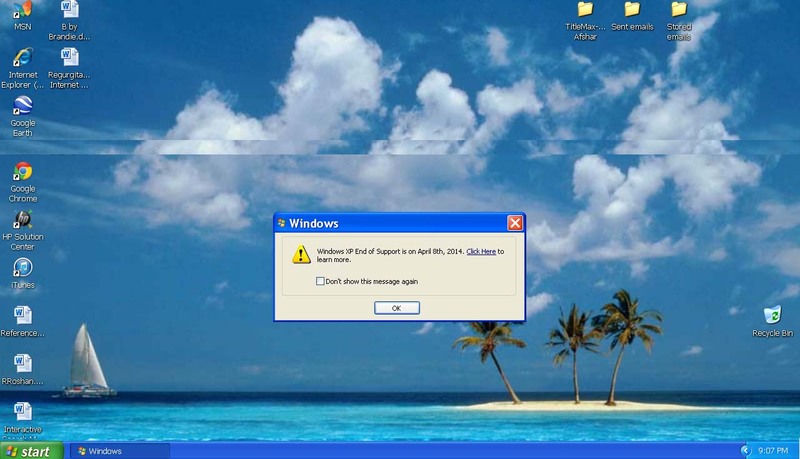 It will be “The Death of our Friend Named Windows-XP.” In other words Microsoft will stop supporting operating system Windows-XP, without extra firewall protection our PCs and computing devices might be hacked. A friend [Windows-XP] who withstood many viruses and bugs, a friend who gave me many great experiences; which Microsoft wants to burry and leave it for the history books. A friend who is no longer invited to enjoy the new technology, or even to sit out on the sideline. All PCs and desktops with Windows-XP, either might step up to the next challenge or they too will join the graveyard of personal computers. Is this really true? How will Microsoft ignore the needs of financial institutions such as Bank of America? They still run Windows-XP! It has been a long time since I have experienced a sense of loss, sadness, and despair. Not everyone enjoys the rocky waves of a brutal ocean, that has not been truly tested, yet, its swim or sink. Microsoft ought to be gentile with the older generation, who really find it difficult to use Windows-8! Even I did not find my way to the programs and I surly don’t care for the many shopping windows and games available on the new touch screen PCs. The Death of our Friend Named Windows-XP, is similar to the death of our old friend “The Telephone!” How many people have land lines? How many people only have a telephone to dial out or receive a call? No, telephones have to be filled with gadgets and multi-purposed. No wonder there are more car accidents today then before. It seems that we people need to be plugged in all the time. Mothers wonder why there children have concentration deficit. Our society and major companies demand that we need to drain ourselves and create the next flawed generation. Our personal computers need to be filled with all the unnecessary gadgets that will distract us, and in the long run, people will lose their jobs, because they played more than they worked. Why may we not keep it simple? For any blog needs, comments or suggestions please contact us. Interesting article, some of my friends still use XP and the PC runs well. I don’t know about Bank of America, but I imagine Microsoft still provides special service to major banks to avoid any lawsuits.